RYE, N.Y.- Check your pockets, look under your couch, search your car, claim your million dollar grand prize before it's too late. "1-6-7-20-49, Powerball 23? are the million-dollar numbers from the drawing Aug. 25, 2012, but the owner of the winning ticket still remains a mystery. The ticketholder has until August 25 to step forward or forfeit the money to a prize pool for future winners. 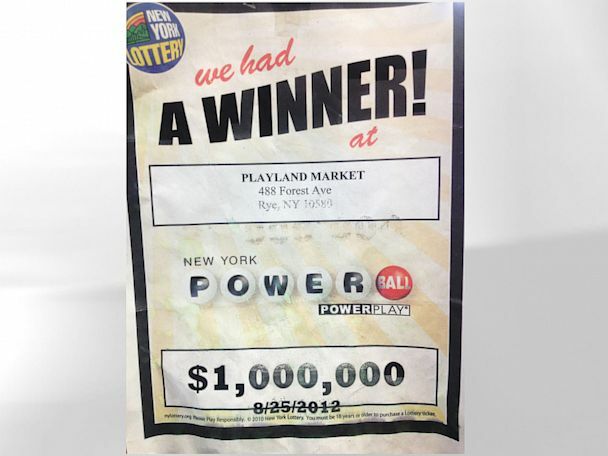 Ralph Alfalahi has put up signs on both entrances of his Playland Market, a Rye deli that sold the winning ticket, to encourage customers to check their tickets and come forward. "We've had a lot of winners for $500 and maybe even a few thousand, but the million dollar ticket, that's the first time we've seen a winner like that," recounts employee Alex Delgado. Delgado admits that he thinks about the prize money sometimes. "If nobody comes forth with the winning ticket, I think that the money should come to the store and I'd get a cut," Delgado says jokingly. "I'd cash the money immediately and pay off my college loans," he adds. New York State Gaming Commission Spokesperson Christy Calicchia says that there are a number of reasons lotteries go unclaimed. "All the common reasons you can think of, from lost tickets to tickets being washed in jean pockets," says Calicchia. For this fiscal year alone, there are nearly $28 million worth of prizes, ranging from instant tickets and lottery draw games, to Powerball, Megamillions, and the Sweet Million lotto, that have been left unclaimed. "Sometimes players don't realize that there is more than one prize," Calicchia explains, "when they hear that the winning ticket, like the recent New Jersey winners, was bought in another state, they lose interest and forget there are other tiered prizes." With this prize, after state and federal taxes are calculated, the winner could take home an estimated $662,000. If this Powerball is left unclaimed, it will be the sixth-largest prize that has gone without a taker in the history of New York lotteries. Amazingly, the largest sum gone uncollected was $68 million from a Mega Millions drawing in Brooklyn back in 2002. Those at the New York Lottery are "hopeful that whoever is the holder of this ticket will come forward and claim the prize, especially with all the emphasis that we are putting on it," says Calicchia.